Australia: T. A. & P. R. Roberts, 1988 Name inside else clean, light wear to edges.. 8th Edition. Hardcover. Good/Good. Australia: Tilbrook Bros., 1971. First edition. Hardcover. Very Good/good. Green hardcover 1st edition in dustjacket. A very good copy with bending to the corners and spine tips. Previous owner's name and date, and 2 bookstore stamps to the endpapers, otherwise a clean copy. Binding is solid, though lacking tightness. Unclipped dustjacket is good only with 2 tears to the bottom of the rear panel, scuffing and soiling to the front panel. 129 pp., indexed, some b/w illustrations and photos. 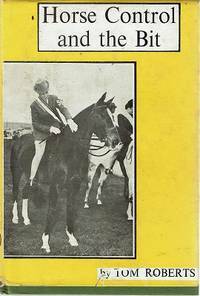 A classic text on horse training by an Australian who grew up in India. printed by Tilbrook Bros. Used - Good. Shows some signs of wear, and may have some markings on the inside. Tilbrook, 1971. First Edition. Hardcover. Very Good/Very Good. Green hardback; firm and square with strong hinges, not showing any snags or splits; complete with original dustjacket, which is very tidy with no tears or chips, just mildly rubbed and edge-worn; contents sound, clean and tight with no pen marks and no loose pages. Not from a library so no such stamps or labels, just a former owner's bookplate at the endpaper. Tidy book in very presentable condition. Horse control and the bit. printed by Tilbrook Bros., 1975. 129 pp. Dustjacket has wear on the edges. Browning to page edges. Copy appears to be unread.. Third Edition. Hardcover with Dustjacket. Very Good/Very Good. 8vo. T.A. Roberts,, 1975.. Hardbound. Very Good.